Top Contributors - Mostafa Mataich, Mathilde De Dobbeleer, Scott Cornish, Ilona Malkauskaite and Lien Hennebel - Killian Borms, Haytem Mkichri, Anna Jansma, Yassin Khomsi. Disorders is a general term to cover a range of conditions. It can be due to trauma, such as joint dislocation of the acromioclavicular joint or degenerative conditions, such as osteoarthritis. An acromioclavicular dislocation is a traumatic dislocation of the joint in which a displacement of the clavicle occurs relative to the shoulder. The acromioclavicular joint is a diarthrodial joint with an interposed fibrocartilagninous meniscal disc that connects the clavicle with the acromion. It has an intra-articular synovium and an articular cartilage interface and is characterised by the various angles of inclination in the sagittal and coronal planes and by a disc. 2 types of disc have been observed; a complete disc (very rare) and a meniscoid-like disc. . The acromioclavicular joint is surrounded by a capsule and reinforced by the superior/inferior capsular ligaments with the coracoclavicular ligaments (trapezoid and conoid) also important structures for stability of the joint. The acromioclavicular (AC) ligament and coracoclavicular (CC) ligaments are part of the static stabilisers of the joint. The AC ligament controls horizontal stability in the anterior­posterior plane whilst the CC ligaments serve to control vertical stability. The conoid part of this ligament attaches posteriorly and medially on the clavicle with the trapezoid part attaches anteriorly and laterally. 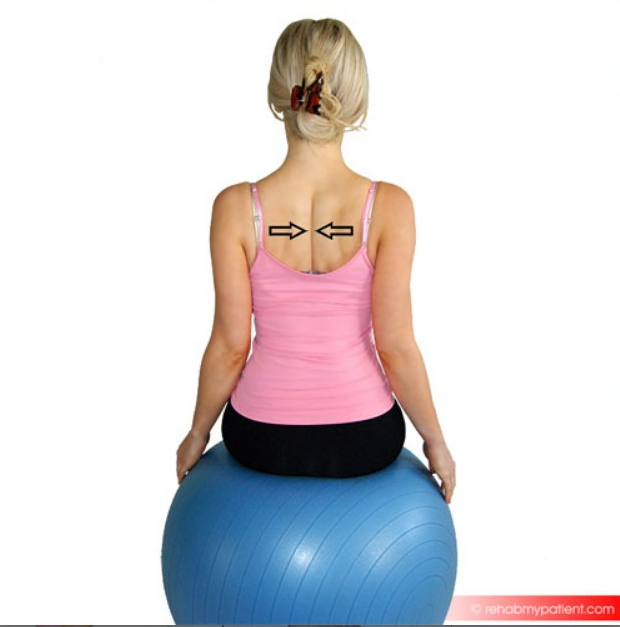 The trapezius and deltoid muscles also provide dynamic stabilisation of the AC joint. Injuries to the AC Joint account for approximately 10% of acute injuries to the shoulder girdle, with separations of the AC Joint accounting for 40% of shoulder girdle injuries in athletes. Commonly, injury happens when falling onto an outstretched hand or elbow, direct blows to the shoulder, or falling onto the point of the shoulder. 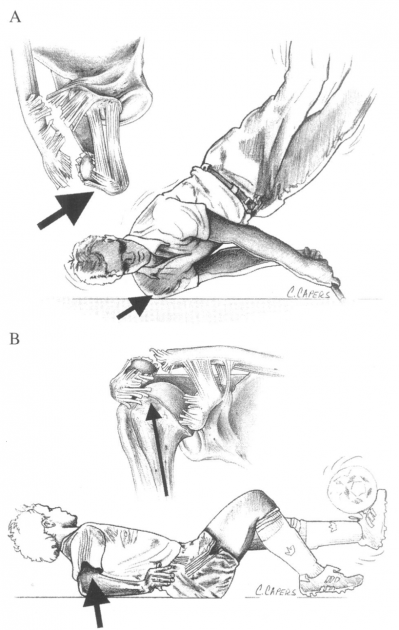 (B) indirect forces to the AC joint can also cause injury. For example ,a fall on to the elbow can drive the humerus proximally, disrupting the AC joint. In this case, the force is referred only to the AC ligaments and not the coracoclavicular ligaments. With an AC joint injury pain is often felt radiating to the neck and deltoid. The AC joint may also becme swollen, the upper extremity often held in adduction with the acromion depressed, which may cause the clavicle to be elevated. AC ligaments are ruptured, CC ligaments are intact. Often described as a subluxation. Complete disruption of both the AC and CC ligaments without significant disruption of the delto-trapezial fascia. This is often described as a dislocation. More severe form of grade III. Complete disruption of both the AC and CC ligaments with disruption of the delto- trapezial fascia. Pseudo lateral clavicle elevation, downward displacement of the scapular. Using digital measurement instead of a solely visual diagnosis is recommended because of the higher intra- and interobserver reliability. Acromioclavicular dislocation is often diagnosed via radiography. Possible problems can occur with patients suffering from a type I injury as nothing abnormal is evident on a radiograph. Diagnosis is therefore determined by the mechanism of injury and tenderness over the AC joint. DASH: Disabilities of the Arm, Shoulder and Hand questionnaires. American Shoulder Elbow Surgeon (ASES): This measures functional limitations and pain in patients with musculoskeletal shoulder pathologies. The functional score is calculated from 10 questions relating to function using a 4 point scale. O’brien test: Examination using the O’Brien test tightens the posterior capsule and posteriorly translates the humeral head, stressing the labrum resulting in pain and weakness. 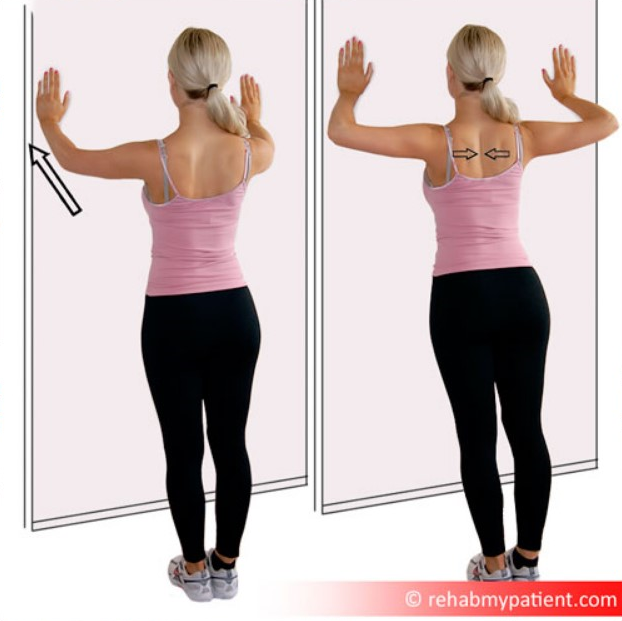 Paxinos sign: Provocative testing for acromioclavicualr joint injury . Walton et al found that the Paxinos test is a good clinical diagnostic tool and bone scanning is the most reliable imaging modality for the diagnosis of AC joint pathology. When both of these tests are positive, there is a high degree of confidence for a diagnosis of AC joint pathology . A history of the mechanism of injury and palpation of the AC joint help to differentiate between a type I and a type II injury. A minor deformity in the AC joint is indicative of a type II injury. In a type I injury, swelling is usually present with pain on abduction of the arm, whereas with a type II pain is usually experienced in all movements of the arm. An obvious step deformity of the AC joint indicates a type III injury and the patient usually supports the injured arm as close as possible to his body. Treating an AC joint injury will vary depending on its severity. Nonoperative treatment is recommended for type I and type II AC separations, but for type III this is still much debated, as there is a high chance of early onset degenerative within the joint. However surgical intervention may be chosen as in certain cases this may yield better functional results, especially where the patient is younger, highly active or where a type III injury does not respond to conservative management. For type IV and V surgical repair is highly recommended. Initial treatment should adhere to the POLICE protocol including protection, optimal loading, ice, compression, elevation and referral within the first 48 hours. A sling should be used to immobilise the shoulder along with keeping the shoulder in a elevated position when at rest. Taping to help support the joint can also be useful. Avoid aggravation of the injury: example of exercises are bench press, prone press-ups, shoulder press or dips. Proximal stability must be reached before strength. Range of motion: regain full range of motion of GHJ (including horizontal adduction), IR/ER at 90° abduction GHJ and capsular stretches. Closed kinetic chain: increase the loads of previous closed kinetic chain exercises. Add active arm elevation and rotation. Plyometric exercisess (dynamic stretch shortening): medicine ball toss and catch, tubing plyometric exercises. Sport specific exercises: a two-hand overhead side to side throw for the overhead athlete. Type V and VI are considered to require surgical repair and physical therapy may follow various post surgical protocols. For type IV and V injuries there is no evidence based literature recommending a specific treatment for these injuries. Surgery is the preferred treatment, but there has been a reported case of the successful use of manual reductions, which converted the type IV to a type II. Apply cold packs to the operated shoulder to reduce pain and swelling. Remove the sling several times a day to gently move the arm in a pendulum motion: lean forward and passively swing the arm. Apply cold to the shoulder for 20 minutes at a time as needed to reduce pain and swelling. Remove the sling several times a day: move the elbow wrist and hand. Lean over and do pendulum exercises for 3 to 5 minutes every 1 to 2 hours. To wash under the operated arm, bend over at the waist and let the arm passively come away from the body. It is safe to wash under the arm in this position. This is the same position as the pendulum exercise. Protocols on active movement and sling use will vary depending on the surgeon and the procedure done. Some will prescribe no active arm movements and the need for a sling for up to 6 weeks. Others may allow sling use as needed and active movement immediately, for example up to 90 degrees in the first two weeks slowly progressing from there. Post-operative rehabilitation then follows similar guidelines as that for Type I and II injuries. Treatment consists initially of ROM exercises, followed by progressive strengthening. Rehabilitation needs to be followed through to full strength and mobility in order to avoid incidence of persistent pain and instability of the AC joint. ↑ Saccomanno MF. Acromioclavicular joint instability: anatomy, biomechanics and evaluation. Joints 2014; 2(2): 87–92. ↑ De Palma AF. Surgical anatomy of the acromioclavicular and sternoclavicular joints. Surg Clin North Am. 1963;43:1541–1550. ↑ Salter EG, Jr, Nasca RJ, Shelley BS. 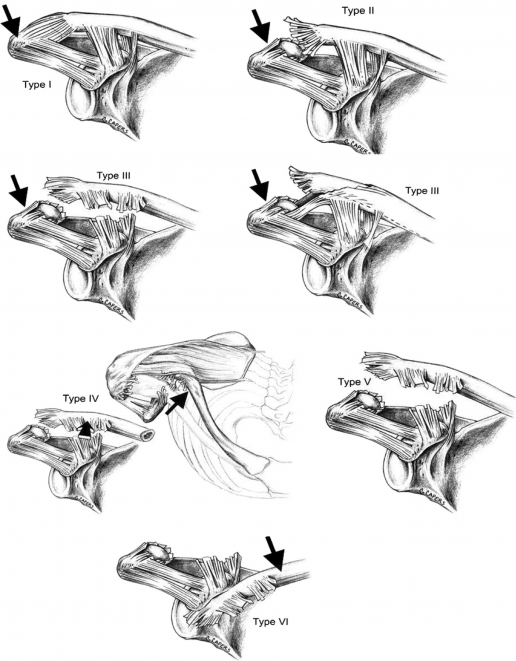 Anatomical observations on the acromioclavicular joint in supporting ligaments. Am J Sports Med 1987;15(3):199-206. ↑ 6.0 6.1 6.2 6.3 Magee DJ, Zachazewski JE, Quillen WS. Pathology and Intervention in Musculoskeletal Rehabilitation.fckLRElsevier Health Sciences, 2008. ↑ Suezie K, Blank A, Strauss E. Management of Type 3 Acromioclavicular Joint Dislocations Current Controversies. Bulletin of the Hospital for Joint Diseases 2014; 72(1): 53­60. ↑ Beim GM. Acromioclavicular joint injuries. Journal of Athletic Training 2000;35(3):261-267. ↑ Johansen JA, Grutter PW, McFarland EG, Petersen SA. Acromioclavicular joint injuries: indications for treatment and treatment options. 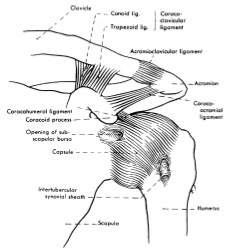 J Shoulder Elbow Surg 2011;20:70-82. ↑ Culp LB, Romani WA. Physical Therapist Examination, Evaluation, and Intervention Following the Surgical Reconstruction of a Grade III Acromioclavicular Joint Separation. Journal of the American physical therapy association 2006; 86:857-869. ↑ 11.0 11.1 Micheli LJ. Encyclopedia of Sports Medicine. London: SAGE Publications, 2010. ↑ 12.0 12.1 12.2 12.3 12.4 Reid D, Polson K, Johnson L, Acromioclavicular Joint Separations Grades I–III A Review of the Literature and Development of Best Practice Guidelines. Sports Med. 2012; 42(8): 681-696. ↑ Schneider MM, Balke M, Koenen P, Fröhlich M, Wafaisade A, Bouillon B, Banerjee M. Inter- and intraobserver reliability of the Rockwood classification in acute acromioclavicular joint dislocations. Knee Surg Sports Traumatol Arthrosc. 2016; 24(7): 2192-6. ↑ Robb AJ, Howitt S, Conservative management of a type III acromioclavicular separation: a case report and 10-year follow-up. Journal of Chiropractic Medicine 2011; 10: 261–271. ↑ 16.0 16.1 16.2 16.3 16.4 16.5 16.6 Fraser-Moodie JA, Shortt NL, Robinson CM. Injuries to the acromioclavicular joint. J Bone Joint Surg. 2008 ;90-B: 697-707. ↑ 18.0 18.1 Harris KD, Deyle GD, Gill NW, Howes RR. Manual Physical Therapy for Injection-Confirmed Nonacute Acromioclavicular Joint Pain. Journal of orthopaedic & sports physical therapy 2012; 42(2): 66-80. ↑ 20.0 20.1 Walton J, Mahajan S, Paxinos A, Marshall J, Bryant C, Shnier R, Quinn R, Murell GAC. Diagnostic Values of Tests for Acromioclavicular Joint Pain. The Journal Of Bone & Joint Surgery 2004; 86-A (4): 807-812. ↑ Culp LB, Romani W. Physical Therapist Examination, Evaluation, and Intervention Following the Surgical Reconstruction of a Grade III Acromioclavicular Joint Separation. Journal of the American physical therapy association 2006; 86:857-869. ↑ 24.0 24.1 Hootman JM. Acromioclavicular Dislocation: Conservative or Surgical Therapy. Athl Train. 2004; 39(1):10–11. ↑ Bannister GC, Wallace WA, Stableforth PG, Hutson MA. The management of acute acromioclavicular dislocation. A randomised prospective controlled trial. Bone Joint Surg Br. 1989; 71(5): 848-850. ↑ Nissen CW, Chatterjee A. Type III acromioclavicular separation: results of a recent survey on its management. Am J Orthop (Belle Mead NJ). 2007 Feb. 36(2):89-93. ↑ Glick JM, Milburn LJ, Haggerty JF, Nishimoto D. Dislocated acromioclavicular joint: follow-up study of 35 unreduced acromioclavicular dislocations. Am J Sports Med 1977; 5: 264-70.